It’s me again, Crazed Replay Guy. Wrote 1924 and You Are There! which is now a book available on Amazon. Also Play That Funky Baseball (re-living 1977) and a 1941 history reversal replay called The Bragging Rights League. This time I’m playing 1958, the first year the Giants and Dodgers landed out west, with a deep focus on the major league baseball roots of the Bay Area. 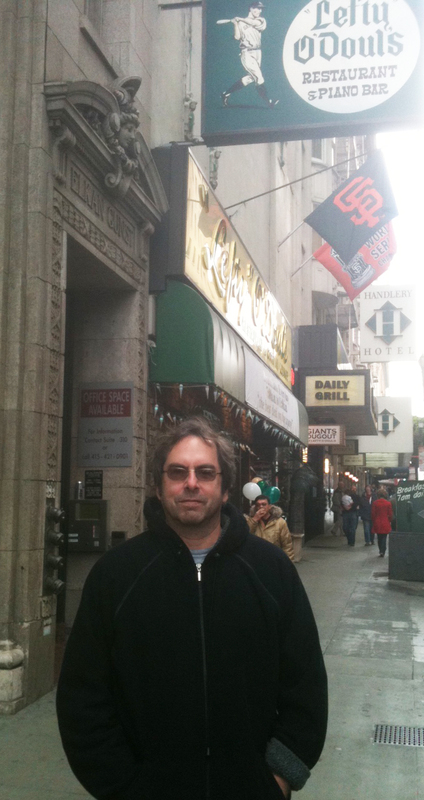 Raised in New England, I now live in L.A., but absolutely love San Francisco and the rich foggy culture enveloping it. A perfect place to set a baseball murder mystery, don’t you think? It’ll take me a bit over a year to replay the season using the dice and cards of Strat-O-Matic baseball, and I’ll be posting bite-sized episodes every Monday, Wednesday and Friday. I cannot predict how the pennant races, or the fates of Seals Stadium usher Snappy Drake and the other characters will play out, but I’m sure glad you’re along for the ride. 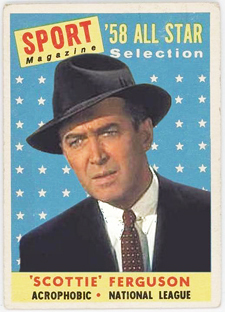 Lastly, big shout-outs to PunkRockPaint for the inspired Jimmy Stewart bubble gum card on your left—my new Twitter avatar—as well as the great Bethany Heck of Eephus League fame for designing the killer film noir Website banner above.—J.P. Anyone have a recommendation for a well written book on the history of Africans Americans in baseball…My husband loves to read about baseball and it would be a great Christmas present but I am clueless on this……Help! “Shades of Glory” by Lawrence Hogan and Jules Tygiel is good, as is the Jackie Robinson biography by Arnold Rampersad. Both are available on Amazon.